Newly restored Oscar Nominated documentary about the course of the Vietnam war on the home front is a must see. 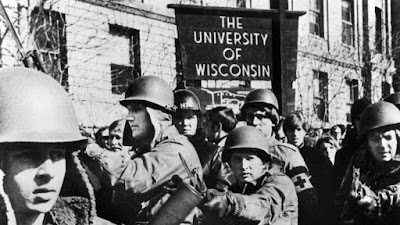 A chronicle of the war in Madison Wisconsin from 1963 through the end of the war through talking heads, photos and film footage, the film reveals to us what it as like in the trenches fighting and protesting to stop the war. What I love about the film is that this is a chronicle of what happened made barely a handful of years after the end of the war. Memory hasn't been clouded by time. What we are being told is something that is fresh in the minds of everyone on screen. They aren't sugar coating anything and details haven't fallen away to be just the good parts. Indeed as the film was being made the country was in the throws of trying to come to terms with the failure of the whole military escapade. We were a country trying to heal after being at war with itself and in THE WAR AT HOME we come to understand the divisions that had split the country. Looking back almost 40 years on it's kind of hard to imagine how this film lost to BEST BOY which is a good film but which really hasn't stood the test of time. THE WAR AT HOME meanwhile has become a vital and important film record that lets us in on what it was like back during the war years. I grew up during the time covered by the film and this is one of the few films where I could reconnect to what it was like. This was exactly how it felt, and what was going on. It is not something colored by thought or academic reconsideration. Highly recommended. The film plays Tuesday night at the New York Film Festival. It will also be getting a re-release in theaters such as the Metrograph in NYC starting Friday.